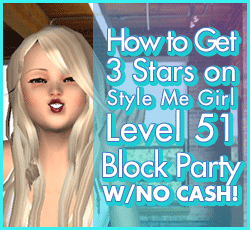 How to Pass Style Me Girl Level 51, "Block Party" & Get 3 Stars WITH NO CASH ITEMS! | I Style Me Girl! How to Pass Style Me Girl Level 51, "Block Party" & Get 3 Stars WITH NO CASH ITEMS! I posted a step by step tutorial on how to pass Style Me Girl Level 51, "Block Party," but the game has updated since then so I had to re-do the level. So, here is my new "Block Party," 3 star, "Stunning," example. 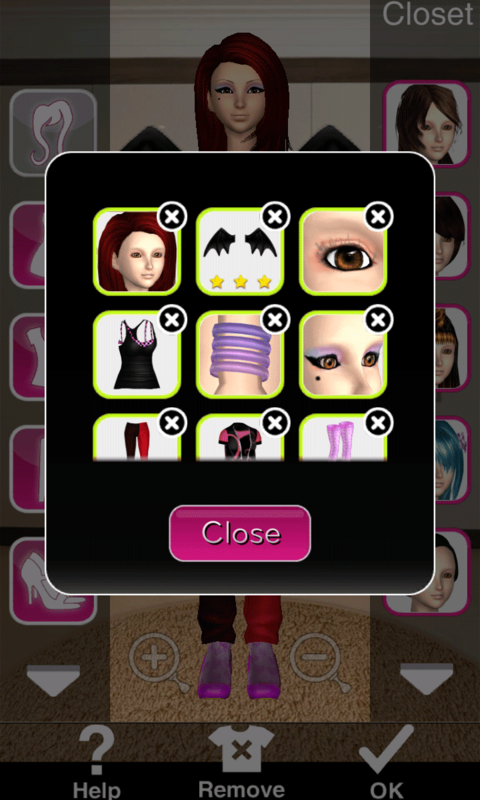 As always, no cash items are used :) If you need help on this level as many a-me-girler does, keep reading to find out how to pass Style Me Girl Level 51, "Block Party," without using any cash items! Click on the screen captures in the "Closet Items," boxes (below right) to view all the items I used in this example on model Rachel, as they appear in my closet. All of the items used are silver coin items, no cash items are used. In the list below I will go through and describe each item one by one. As you can see in the image at left, I earned three stars for this style on Style Me Girl Level 51, "Block Party," modeled by Rachel. Neither version works. I need help. I finally got it with the ugliest outfit ever. Bright fire engine red hair with side part. Purple tank top with hot pink border. In order to get bat wings, you have to get 3 stars on the Halloween level. But follow this all except use the purple and black pants that look just like the ones she chose. And use red lipstick instead.